I’ve been playing around with Stickybits, a new app-based solution that connects a barcode scanning app for your phone with the ability to generate unique barcodes and attach “bits” (comments, URLs, etc.) that appear when the barcode is scanned. As a marketer, I immediately started thinking of ways to utilize this to expand my company’s presence, awareness, and ability to put content into the hands of our prospects. 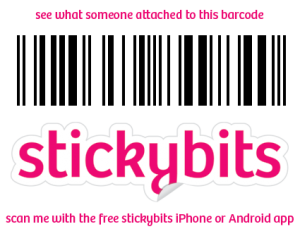 I also thought that – as Stickybits promotes on their website – this would be a fantastic addition to a business card. But once I really drilled down into applying Stickybits as a marketer, things started to unravel. Stickybit # 6925359849840, better known as "Jason Rushin's resume." Stickybits was a big hit at this year’s SXSW and has gotten wide coverage from CNET, ReadWriteWeb and others, but the general vibe seems to be, “What will people do with this?” And therein lies the crux of Stickybits’ challenge: there are some great ideas beginning to surface, but the execution is still a few versions from solid. Convince a stranger to add this new Stickybits app to their phone – an app that your company didn’t create and that is essentially bloatware as far as the stranger is concerned. Wait while they downloaded and installed it, hoping that the connection in the event hall was strong enough for a speedy download. Explain to them how to use the app, and essentially become a salesperson for Stickybits for a few minutes. Finally, walk them through getting a snapshot of the barcode quickly, and then explain how they can access your marketing materials within Stickybits. Let’s assume that you could get past these initial steps, maybe make it fun for people to download the app and not take more than a few minutes of their precious time. 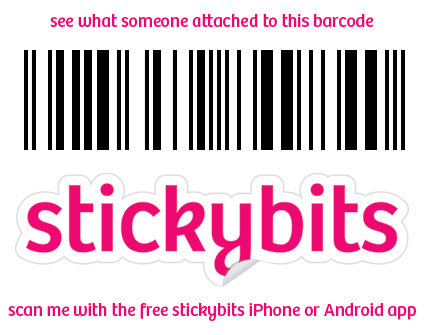 This is where Stickybits really falls down from a usage perspective: the “bits,” as they refer to the notes attached to a barcode, don’t really pop anything up. The app just lists the links as text, requiring the user to scroll through and click on the link they want to see. While this isn’t that big of a deal, it is another step and does dramatically limit the “awesome” factor of the experience. The bits are formatted much like comments to a blog, so there’s not really any formatting or categorization. And currently, anyone can attach new bits to the barcode, which totally limits, if not outright eliminates, its usage for corporate marketing. (Imagine a competitor scanning your barcode then adding their collateral as well…or something worse. Yes, as the barcode owner, you can delete bits, but you need to do it proactively.) The final drawback in this scenario is that your links appear on your prospect’s phone, with no obvious way to forward them to an email address for viewing on a bigger screen, passing on to colleagues, or printing. A major hurdle here is the need for the Stickybits app specifically, not just any barcode scanning app. On my Android phone, I now have four barcode scanning apps, including Stickybits. Yes, that’s probably a bit excessive but I’m assuming that a good number of people already have at least one, and it would be nice to facilitate that whole process by eliminating the need to download another app just for this one-time scan. But then again, that’s how Stickybits will become pervasive. Despite these drawbacks, the potential here is enormous. Adding a barcode to collateral that drives prospects to a microsite, a special promotion, or a related video would be useful. A barcode on your event schwag would turn your stress ball into an instant, persistent data sheet. Barcodes on event badges would be a great idea too, letting attendees scan each other for business card information and whatever else each attendee wanted to attach to their badge. In addition to corporate marketing, it would be great for a museum to add additional content to each exhibited item, or for a tourism bureau to add backgrounds, photos, and maps to a point-of-interest (wouldn’t it be great to know the details behind a historic building as you snapped the Stickybit attached to the cornerstone plaque?). It would also be neat as the basis for a self-guided tour, where each barcode gives you info on your current location as well as directions to your next stop on the tour. Think of the cool tie-ins with augmented reality apps showing what’s around you or what used to be there (say you’re standing at San Francisco’s city hall and you could see photos from the aftermath of the 1906 earthquake). There could even be links to relevant maps, audio, video, and upcoming events. 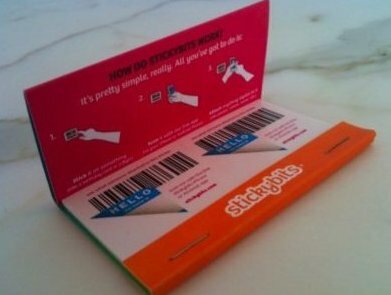 The challenge that I had, and that I’m sure a lot of visitors to stickybits.com have is, “What do I do with it?” Yes, there are some initial ideas, like the business card or the greeting card, but the execution does not yet live up to the promise. Reading their forums, it looks like a lot of my concerns are shared by others, and that Stickybits is taking note and promising to address some of them. In the meantime, I’ll be using the few barcodes that I’ve downloaded, and I’ll be keeping an eye on the Stickybits solution as they advance the capabilities. It truly does have a ton of potential, and I can’t wait for their next few iterations to add things like branding (which they already allow for product UPC codes), more interactive bits with embedded videos and document viewers, and hopefully the ability to scan Stickybits’ barcodes with other scanning apps. As an aside, Stickybits’ has an opportunity to improve their website navigation and really get people excited much more quickly. It took me a lot of random clicking to figure out how to get off of their homepage, but once beyond that, the sidebar menu was very intuitive. I’m assuming that the average prospect will be unsure how or why to use Stickybits initially, and their website doesn’t do much to help ease the process or make it seem obvious. I would bring the “few examples” above the fold, or better yet, incorporate those into the three steps in the thought bubble. I would also bring their site navigation out to the homepage. Yes, I’m sure they purposely limit the links to ones that prompt visitors to download their app – more downloads equal more potential users – but even that’s not intuitive (you have to click on the “Get the app” guy). Bottom line: it’s a killer idea that’s just about six months away from being a killer marketing solution.